Here is some video from Thursday's PEP where 24 more schools were closed. I did not stay for the school co-location vote as it was quite late by the time the puppets voted to close all 24 schools with no consideration to the public outcry. This video was made on behalf of GEM (Grassroots Education Movement). Apologies for any errors or mis-spellings. They are in reverse order of the evening's proceedings. I was out of town so I missed it. Thanks to Pat for doing all this work. Queens representative to the PEP , Dmytro Fedkowskyj: Presents a resolution to withdraw the proposals for turnaround/closure and place a moratorium on the transformation model. A member on the Citywide Council for High Schools: The discussion needs to be on how we are going to support our schools...not on how we are going to close them. CPE (Coalition for Public Education) member, Akinlabi McCall calls for a People's Board of Education. Student on behalf of Student Activists United: We're the 13%. Watch the DOE goon standing over her. City Council Member, Leticia James speaks against the co-location of a fifth school at the 117 K campus. CEC 3 member, Noah Gotbaum: The whole process is a lie. Graduate of Newtown High School: You're decreasing the moral of the students. UFT Vice President, Leo Casey: This process is a sham. It's illegitimate and it has no honor. Graduate of Automotive High School and retired NYC worker: You can't and have not given the administration of these schools the backing they need. We are prepping a new generation to be a lost generation. CEC 14 member, Elaine Manatu: I'm here on the victimization of the kids from MS 126 and on the closure of Automotive HS. Paola De Kock, President of the Citywide Council of High Schools: ...shows how arbitrary and downright cruel the turnaround plan is...there is no plan, there is a model. President of CDEC 3: Opposes the co-location of Harlem Success Charter School at PS 149 and the mistreatment of special needs children by Harlem Success. CDEC 30 Representative: Nowhere in the Federal turnaround model is closure mentioned. CEC member/Parent speaks about how there is no proof that the turnaround model works. Councilman Jumaane Williams: Many of you are just doing his (the Mayor's) bidding...I don't know how you sleep at night. The community has not been engaged about the proposal to move The Renaissance School from M99 to PS 155. Queens elected official and parent: Calls on the PEP to save the other 24 schools. We cannot afford to turn our backs now...you will be using a form of union busting. Brooklyn Borough President, Marty Markowitz: Stop demonizing our teachers and public educators. Schools not jails! The puppets are introduced. I got back Sunday night from a 5-day trip to Virginia and Washington DC where we spent a night in Winchester - and George Washington really slept there when he had an office in town in 1755 - and a night in Charlottesville and visited Thomas Jefferson's Monticello, did a drive-by of James Monroe's house and finished up with James Madison's Montpelier. I wrote on the Saturday Night Special (a new feature of Ed Notes), Bloomberg Leads Dead Presidents Society, only Madison is still alive as a school in NYC. Spending a day with the ghosts of the guys who wrote the Declaration of Independence and and the US Constitution leads one to thoughts of democracy, which you should think about as you read the opening quote from a report of the weekend NYSUT convention, which capsulizes exactly what the 800 Unity Caucus people were up in Buffalo to do: make sure there is no stand opposing high stakes testing and ending evaluation of teachers based on test scores. Ask you Unity chapter leader exactly how he or she voted and watch the deer in headlights look. I never fail to be astounded by the Unity Caucus sheep, especially those working in schools, who will go along with every policy that cuts the throats of the people they work with. Remember that in the upcoming chapter leader and delegate elections -- and consider running at least for delegate (not to be confused with the elections for NYSUT/AFT delegates in 2013) where you can join with other independents next year to try to put an end to the madness. (Running For Chapter Leader or Delegate? Join the MORE Support Group- Thurs May 3). 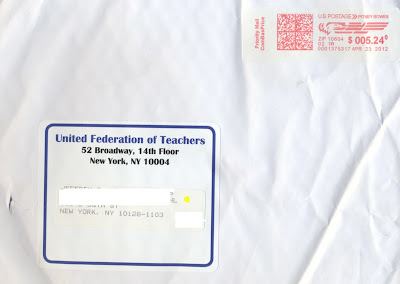 If you read this blog regularly you should realize that when we talk about the UFT, NYSUT or the AFT and their leaders, they are all one and the same. The UFT with by far the largest block of members controls NYSUT and the AFT (NYSUT is something like 40% of the AFT). With 800 Unity Caucus members up in Buffalo this past weekend and the upcoming AFT convention in Detroit at the end of July and with UFT elections coming up in March 2013 which will elect the next batch of 800 Unity Caucus delegates to control NYSUT and the AFT through 2015, it is important for everyone to see how the blocks interlock. Watch for follow-ups this week that might help to tie things together. This leaflet and the report below was sent to me by a NYSUT delegate not from the UFT/Unity. There was a rally on the first day. About 30 people were there. We chanted "APPR won't raise the bar." People were very focused on APPR and seemed hesitant to change the conversation to issues around privatization, etc. Some were chanting "we are NYSUT too." Some NYSUT leaders were in the back also participating, but staying hidden. The rally lasted about 1 hour and of course the police were out on horseback. I met a few people who were all from the Buffalo Teachers Association. Commissioner King did a Q&A on the second day. Things were very heated. One teacher (from Syracuse) came to the mic and called for his resignation. I gave him my e-mail afterward. He said he has a newsletter and he will be sending me more information about that. It may be useful to connect with him. The Buffalo Teachers Association called for a walkout when King gave his speech. In fact, the president of the association was actually given the opportunity to address the entire body from the stage asking people to walk out and explaining why he and others would be. He ended his speech "with thank you to the NYSUT leadership for letting me do this" I later heard that the NYSUT president and the Buffalo teachers association president hate each other. In fact, the NYSUT president alluded to the walk-out several times afterward encouraging people to stay in their seats. He also asked the NYSUT board of directors to stay (and presumably encouraged them to ask the members of their locals to stay as well). About 30 people or so walked out. Some stayed and held signs saying "our students are not a number." King was dispassionate and calm when answering all questions. He mostly talked about the common core being the answer to all problems. When asked about teacher buy in, he skirted the question. He also said that one solution to time being wasted when teachers have to leave their classrooms to grade could be solved by outsourcing grading to a testing company. That was one of the more egregious comments. The next day, king was quoted as saying something to the affect of "I think the union has brainwashed teachers into hating me." The committee meetings were very interesting. Many teachers associations proposed resolutions that were too strong in language for the board of directors. One wanted to add "NYSUT should stop the SED's obsession with standardized tests" which was quickly shot down. another resolution wanted nysut to "end the quantification of teacher evaluation through test scores," which was also quickly shot down. essentially, members (mostly from UFT local 2) came and spoke in opposition and then (before anyone had a chance to rebut) someone (mostly the same person) would "call the question," most people would vote to close the debate and that would be that. This happened several times. It may be worth getting in touch with the authors of the non-amended resolutions (mostly teachers associations from upstate) to see where they are at. We are thinking of doing this for one resolution in particular which called NYSUT to begin a formal study of the affects of HST. On the last day, a teacher named John Galloway (I think from Buffalo) came to the mic for a "special order of business," which was regarding the flyer I sent you. He proposed a "return to core principles resolution," which I'm guessing demanded NYSUT to stop capitulating to every SED demand. The NYSUT president seemed annoyed (as did everyone else around me). He took a copy of the resolution and then declared that the speaker was out of order because he could have brought the resolution to NYSUT before the deadline. The entire thing was shut down very quickly. It may be worth it for MORE to reach out to him and his group. Thinking about running for chapter leader or delegate (or know someone who is) but need help with your campaign? Not sure what building a strong chapter would entail? Here is a chance to connect with other folks who are running for Chapter Leader or Delegate to compare notes, get advice, and talk about how we can build stronger chapters. In a brilliant presentation Stuyvesant HS teacher Gary Rubinstein uses statistics to punch holes in the high stakes testing standardized testing program. He also finds evidence in the stats that charter schools cream better students. Then he addresses the reason why Bill Gates and Michelle Rhee opposed the release of data scores --- they knew people like Gary would be able to show how irrelevant they really were. "It's like in trying to measure temperature, you count the number of people wearing hats." Then he addresses the issue of why a union agreed to any of this, even 20% given that under the current system almost everyone potentially can be rated ineffective. He offered the union his help to salvage the other 20% but has not heard back yet. There's supposed to be this evil union only about the adults but they really aren't doing a good job at that. Event sponsored by Grassroots Education Movement, Class Size Matters, Parents Across America. See videos of other speakers posted on the Grassroots Education Movement Vimeo channel. GEM/PAA/CSM Teacher Evaluation Forum: Gary Rubinstein from Grassroots Education Movement on Vimeo. Michael Winerip takes on the stats in the school grading reports in today's NY Times. The UFT/Unity Caucus leadership have adopted the same attitude towards the members as Tweed has towards the schools: we bear no responsibility. It is all on you. The other day I posted some thoughts on Rule 10 which gives 20+ year teachers the right to remain in their schools even when they are being phased out. (Closing Schools and Rule 10 Defense of 20+ Year Teachers). I heard from a CL that the UFT is well aware of Rule 10 and there has even been discussion at his district chapter leader meetings. "They are definitely not averse to using it and are aware of it," he said. This left me scratching my head. If the UFT is aware and not averse to using it, why not just use it? I don't read the UFT paper or chapter leader updates. Have they informed all chapter leaders at these schools that Rule 10 is an option? Have they helped besieged people at these schools by writing up mass grievances? I bet they haven't but inform me if I am wrong. Is it that some people in the union are aware and others are not? Does the UFT keep secrets from its own people? There was some debate on this issue on ICE-mail and in the comments section with even experienced union activists not sure. But the school does exist for 3 more years. That is why Bloomberg switched to the turnaround model which allows them to close it in a short time. Has anyone heard of the UFT ever opposing these quick change models? In fact they have gone to schools and pushed them as their savior. (Ed Notes Online: Where's Waldo – er– the Union at Far Rock?) Here a teacher chronicles a visit from then Queens HS District Rep and now Queens borough rep Rona Freiser on the day the Far Rockaway HS phase-out was announced. according to a UFT Special Rep last night, it’s only bound to the school… So, Rule 10 doesn’t apply to protect teachers in closing schools. Does “except for those in neighboring schools who are excessed to staff a newly organized school” mean rule 10 only applies if the school is not reorganized? What’s “neighboring schools”. That phrase “…who are excessed TO staff a newly organized school” means what? Does that mean staff excessed AWAY from their school so it can be newly organized, or, so that the excessed staff can staff the new school? So the UFT contract and a UFT special rep say things that doesn't enlighten but further confuse. 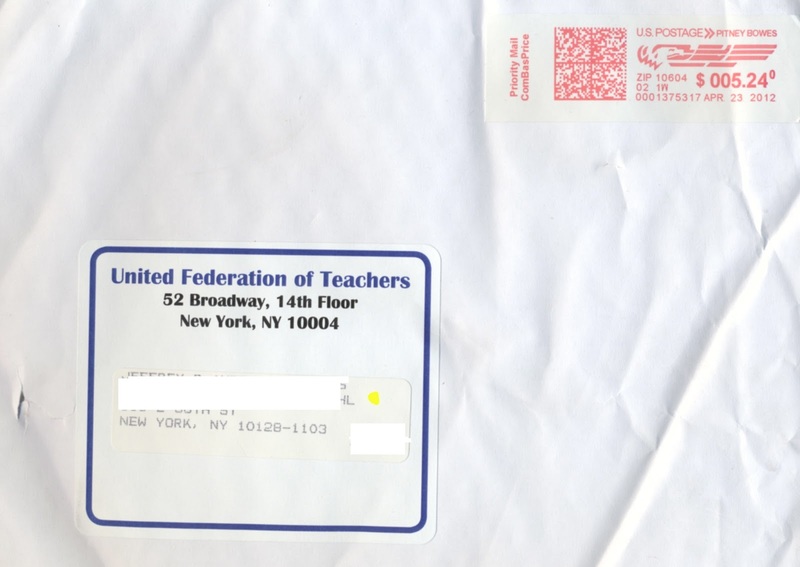 Really, is the UFT allowing language that gives the DOE a way around the contract? The giant loophole --- "wink, wink you can get what you want but this protects us from the members" deal? Until the school shuts down completely, we should be safe. That clause is clear. If the school no longer exists, then it is a different story. After the school is closed, it does not help but our school is phasing out so it still exists. So why isn't this being blasted around by the UFT as chip to protect senior teachers? Well, really, what's the point in even asking this question, except for the fact that there are all too many people out there who should know better who somehow think the UFT leadership's priority is to work for the members instead of their own much more narrow interests. Take the current use of turn-around with the legal fiction that you can close a school on June 30 and reopen it on July 1 and just by changing the name you have eliminated Rule 10 and other contract provisions the UFT seems to have accepted that as a fait accompli -- and shame on them for either being ignorant, not paying attention or complicit. ISN'T IT TIME TO CHALLENGE THE UNITY CAUCUS MACHINE? CHECK OUT THE MOVEMENT OF RANK AND FILE EDUCATORS (MORE) THE NEW CAUCUS IN FORMATION, WORKING TO ESTABLISH A DEMOCRATIC FRAMEWORK FOR THE UFT. THE CAUCUS WILL NEED PEOPLE IN EVERY SCHOOL AS CONDUITS OF LITERATURE TO COUNTER THE UNITY MACHINE. YOU CAN JOIN THE CAUCUS ON MAY 12 AT THE NEXT MEETING. EMAIL ME FOR DETAILS. How many US Presidents have they killed off by closing schools named after them here in NYC? We've been tooling around Virginia visiting the homes of Jefferson, Madison and Monroe and I realized that two of these schools have been closed. That's presidents 3 and 5. Madison is lucky that 3 US Senators and a Supreme Court Justice went to his school. But with pressure from all the other closed big schools, the guy who wrote the US Constitution can't have long. Number two, John Adams --- soon to be closed. George Washington HS was done in before WalBloom. Let's see, I'm trying to go in order. Andrew Jackson? Closed, pre WalBlooom. I forget, is Van Buren on the current list? Teddy Roosevelt – gone. JFK went down last year thus killing him off twice in less than 50 years. Is Walcott the Lee Harvey Oswald of the DOE? Is Bloomberg the reincarnation of John Wilkes Boothe? Given his civil rights record in denying parents of color the most basic rights enjoyed by suburban school systems, he just might be. FDR waa just pulled off the closed list -- for now. Lincoln looks OK -- also for now but the DOE dogs are nipping at Abe's heels. 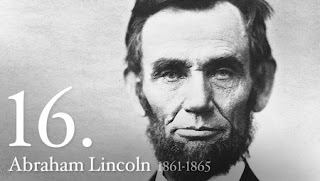 Can we have a separate corps of closed schools named after assassinated presidents once they close Lincoln? With JFK gone, Garfield and McKinley need schools named after them so they can be closed one day. Can we add almost assassinated presidents like Regan? Why not put Eva Moskowitz schools into the assassinated presidents district just for some bad karma? Since there is a clear goal of closing every school named after a US President it's really too bad we don't have a school named after George W. Bush. The above thoughts came on a 5-day trip to Virginia and Washington DC. We spent a night in Winchester - and George Washington really slept there when he had an office in town in 1755 - and a night in Charlottesville and visited Thomas Jefferson's Monticello, did a drive-by of James Monroe's house and finished up with James Madison's Montpelier. Spending a day with the ghosts of the guys who wrote the Declaration of Independence and and the US Constitution leads one to thoughts of democracy or the lack of that exists in our school system. Notes: The Saturday Night Special will be a regular feature published at 7PM every Saturday - when I remember. Carol Burris, one of the leaders of the NY State principal revolt lays it all out in her statement at the Teacher Evaluation Nightmare forum on April 17, 2012. Her statement includes some serious criticism of the role played by NYSUT and the UFT. GEM Teacher Evaluation Forum Carol Burris Statement from Grassroots Education Movement on Vimeo. Fred who is on GEM's Change the Stakes committee sent in this piece published at the WAPO Answer Sheet blog. This was written by Fred Smith, a retired New York City Board of Education senior analyst who worked for the public school system in test research and development. The recent Pineapple and the Hare fiasco does more than identify a daft reading passage on New York State’s 8th grade English Language Arts test. Education Commissioner John King scrapped the selection and its six multiple-choice items, admitting they were “ambiguous,” when the questions became public last week. The episode opens the door to discussing how the 2012 exams were put together. The State Education Department signed a five-year, $32 million agreement with NCS Pearson to develop English Language Arts and math assessments in grades three to eight. In fact, math testing was administered over three days this week for 1.2 million students. Pearson has grown immensely over the last decade, securing contracts with many states required to test students under the No Child Left Behind Act. This year it succeeded CTB/McGraw-Hill as New York’s test vendor. The ever-increasing and implausibly high percentages of students deemed proficient on CTB’s exams was a test bubble that finally burst in 2009, as sobering data from community colleges revealed that most entrants were inadequately prepared in reading and math. Albany admitted the cut off points defining proficiency had been set too low. Blame for the incredible results was ascribed to “stand-alone” field testing, where items are tried out to see how samples of students perform on them and to identify which ones will appear on the real aka operational tests. The success of this method depends on sampling students who are representative of the test population and who will take the no-stakes field tests seriously. CTB’s stand-alone field tests were given to students who had little motivation to do well on them. This led to miscalculations in constructing subsequent statewide exams. To overcome the problem State Education Department officials sought vendors who would embed field test items — specifically, multiple-choice questions—inside the real exam. Pearson won the bid. Thus, last week’s English Language Arts test contained try-out items that won’t count in scoring the test and operational items that will. The assumption behind this approach is that students will strive to do well on all items since they don’t know which ones actually count in evaluating them (and their teachers and schools). By design, about one-third of the multiple-choice items do not count. Performance on these items will be studied to decide which should go on 2013’s exams. Where does the pineapple come in? Pearson’s contract also calls for the vendor to provide 20-25 nationally-normed multiple-choice questions per grade. This is to allow students to be compared with students from other states. The pineapple passage was part of this stipulation. The material was drawn from Pearson’s item bank — material that had been seen in several other states handled by the vendor. That explains the buzz generated when it cropped up last week. Students past and present who read The Pineapple and the Hare posted versions of this story and shared stunned reactions to it. Many wondered how, on its face, it could have survived field testing runs and passed the State Education Department’s own teacher review processes. By contract, Pearson is bound to provide 120-150 nationally normed ELA and math items to New York — items that have been exposed elsewhere. It will make money re-using previously developed items and selling them to Albany. Afterward, the vendor can sell them to other states, having banked a wealth of data showing how over one million more kids fared on its questions. Ironically, despite its shortcomings, the State Eduation Department and Pearson will revert to stand-alone field testing this June to try out other multiple-choice and open-ended questions for use on next spring’s exams. Prediction: There will be many more revelations, and deja vu item experiences this year as the State Education Department/Pearson partnership launches. And because of the way the tests were hastily re-configured in December — reducing the number of multiple-choice items by 20 percent — expect errors within the items, mechanical mistakes (in test distribution and scoring) and technical foul-ups. It looks like the vendor has worked out an amazing testing scheme — producing items along the way, paid for by one or another state, owned by Pearson, and then re-sold and re-sold to other states for developmental purposes or operational use. It doesn’t say EXCEPT in the event of a school closing. “Teachers at all levels who have served 20 years or longer on regular appointment shall not be excessed…” ---Art. 17, Rule 10, UFT contract. I filed a rule 10 grievance and won this year for three of my members --- Murry Bergtraum CL John Elfrank writing on ICE-Mail. Is this a winnable grievance? Or can it go to PERB? Can a teacher with over 20 years at, say, John Dewey who is not hired actually win such a grievance? If so why hasn't the UFT raised it? Why not try it anyway? James Eterno also won cases on these grounds. Anyone with more info leave a comment or email me. I know we won't be hearing from anyone in Unity Caucus who are shuffling in Buffalo. I'm not going to go into the PEP and the schools pulled off the list or some of the changes affecting Moskowitz schools. Leonie and Gotham will do all of that. I will put up more links to the videos from last week's GEM forum. And you should check out a follow-up from Leonie on a story we broke here about the HSA parent handbook. Here is a link to a google doc of the entire handbook. Really fun reading on what they make parents do. Does “except for those in neighboring schools who are excessed to staff a newly organized school.” mean rule 10 only applies if the school is not reorganized? What’s “neighboring schools”. That phrase “…who are excessed TO staff a newly organized school” means what? Does that mean staff excessed AWAY from their school so it can be newly organized, or, so that the excessed staff can staff the new school? I think we need clarity on this. Many UFT officials will be missing in action from the PEP today ---- but do me a favor if you are there and look under the seats to make sure. I hear Leo Casey is there all alone so say hello. You see, Unity officials both high and low -- including your local Unity Caucus chapter leader at the school level and any other Unity Caucus slugs you work with, have shuffled off to Buffalo for the NYSUT convention where they will tell people how it doesn't really matter if teachers are rated based on kids who never show up (which the Buffalo teachers will be protesting with a walkout). Or how 20% is meaningless even if we all know value-added is all screwed up. And the other 20% -- who knows? Let me explain exactly about this perk --- round trip ticket to Buffalo, a few nights in a nice hotel and meal money for the 800 elected Unity Caucus delegates to the conventions of NYSUT (yearly) and the national AFT(every 2 years with this July's junket coming up). And there will be staffers going too so make it 900. You do the math but the AFT Seattle 2010 convention cost a few million dollars from our dues. 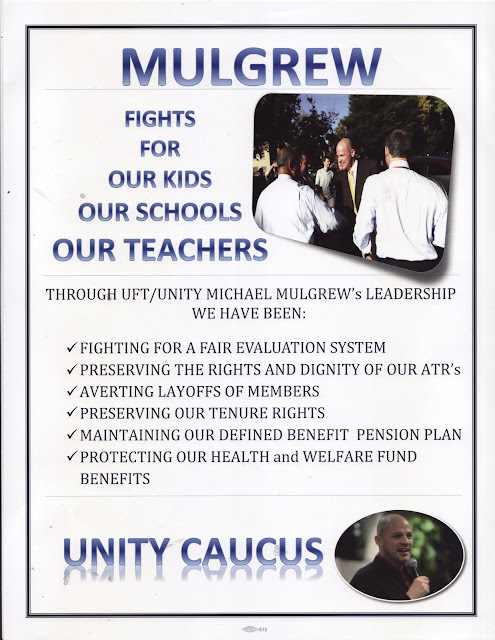 Now I also want to keep bringing up the Unity Caucus leaflet that was sent out to chapter leaders at their schools to be put in the mailboxes. Check the envelope someone scanned for me and note the return address. To me this is a sign or worry as the leadership tries to keep the power of Unity to control the union under cover until election time which doesn't begin until Jan.
See the leaflets themselves in my recent post. My suggestion is to make sure every single person in your school sees this lame effort. Did you hear Mulgrew's response when asked for how long teachers can be denied tenure? "If it goes beyond 2 years let us know." That ought to sell the young teachers on how Unity is defending them. And remind everyone that the UFT/AFT/NYSUT leaders have so far refused to support the national reso against high stakes testing. My wife is from one of the schools that will be closed. She told me that the school were livid when they found out that the UFT is not even going to the PEP meeting. She doesn't undersand this. My wife is especially irate at Mulgrew (more than she is at the mayor)....she can't believe that he has let NYC and NYC teachers down big time. She always believed in the UFT. Unlike the UFT, she is attending the PEP meeting with some teachers in her school. She was worried that no parents would go as transportation there and parking there is not very good. The UFT should have provided buses to all schools. Holding another rally or whatever is futile and weak. NYC teachers need a union that represents them and that fights against injustice against teachers (and students). The closing of these 25 schools, blaming the staff for things that are out of their control (ie. students in poverty, students in gangs, students who come from junior high school with very low reading and writing scores or students and so on) and stating that the teachers' efforts are not good enough and that for these students graduating in five or six years is not indeed a victory....well, this is really for all citizens of NYC. Anyone who is not rehired in their original school will be labeled as bad teachers Their careers will be in ruins. The powers that be, in collusion with the UFT. are destroying public education by making teaching an unviable and unattractive career. Within a few years, there will be major teacher shortages. Today's PEP promises to be the usual, with the usual suspects. Except don't expect the UFT to be there. This excerpt came in from a chapter leader to the staff of one of the turnarounds. The UFT insists that the Rally at City Hall is extremely important, they feel that the PEP is futile. They advise that we go to the Rally first and foremost, and as time allows if people wish to attend the PEP to do so, but the UFT leadership feels that attendance legitimizes the PEP as a decision making body. I guess I don't see how a rally at city hall is somehow crucial and also how the union feels that by showing up it legitimizes the PEP. 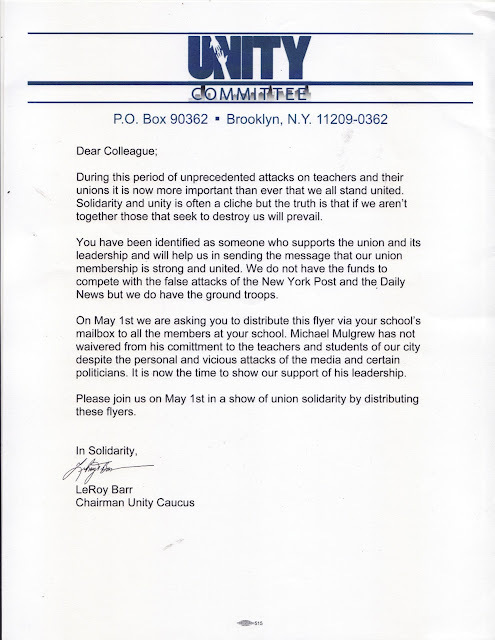 What really is going on here is that by showing up at the PEP the UFT leadership is shown up for being toothless. Remember, they supported the process that brought us the PEP in the first place in 2002 and then in 2010 bragged about how they helped get the law modified to control the mayor. OK, you can laugh out loud now. Also what is going on here is that Occupy DOE is engaging in actions at the PEP once again. Months ago the UFT pulled the same tactic by telling people not to go in but did bring people down to Brooklyn Tech and then try to lure them to another location. That didn't work and they ended up joining ODOE inside. Now they are trying to make sure that people from closing schools are nowhere near the PEP and ODOE, which the union/Unity Caucus leadership views as aligned with the new caucus in the process of formation which declared itself as Movement of Rank and File Educators (MORE) on Saturday and affirmed they will be running in the UFT elections early 2013 (I was in the extreme minority of urging them to not run but use the opportunity to build the infrastructure -- or ground game --- of the group before jumping into an election. But the majority thought it is possible to do both and I will do what I can to help that along even if my position did not carry. In the light of that, we found that today various chapter leaders around the city received a package of leaflets from Unity Caucus and were asked to distribute them on May 1 to the members. This is unprecedented and a clear sign of worry that MORE may be a threat. I'm saving Unity the trouble of waiting 'till May 1 and publishing them here. One of the funniest parts of the leaflet is that they are trying to make it look like they are social justice unionists, given that MORE is the first caucus in the UFT with a large base of newer, younger teachers (I saw more tattoos in that room on Saturday than I have in a long time.) This should turn out to be fun -- and I don't have to work too hard either as they have enormous energy. This does MORE a big favor in that most teachers have no idea what Unity is --- they knew they were being screwed but weren't clear who was doing the screwing. This weekend 800 Unity Klones are traveling up to Buffalo to the NYSUT convention at our expense to cast their vote as one. We know they won't be joining the Buffalo teachers in a walkout but GEM will have a rep there from another union to report back to us. Just look at the checklist of how Mulgrew has fought for all those things for you. Which gives you the biggest howl? The fair evaluation system? The ATRs? Defending your tenure rights? Sorry, I can't go on I am holding my sides. The NY Daily News was right. There is a Pineapple in charge of state testing. Did you hear Merryl Tisch on Brian Lehrer today? Boy an I increasingly disappointed in Brian who basically let her filibuster her way through the interview. She put down cosmetology as a legit career --- she must be a beauty school dropout. Brian didn't challenge her on aiding and abetting the closing of so many vocational programs and schools by the BloomShmucks though he did raise the point about going back to different diplomas. On the global studies he let her get away with saying they have to complete the course work, an obfuscation of the talk about dropping the regent test requirement. Sure, do away with the high stakes test that make your policies look very bad indeed but "require" the course -- with a bit of credit recovery I can see 100% grad rates -- and 100% remediation rates. Good call-in from Verne though (who I've met) on the fact he is sending his kid to private kindergarten due to high stakes testing. Wouldn't it be great if Tisch ran for mayor? Here are some reactions today to the statewide tests today. More fun and games. And 2 more days to go. 1. The city scheduled tree pruning complete with mulching machines on our school block during testing time today. The noise was ridiculous and not conducive to testing to say the least. Can't make this @#*! Up. 2. This one is truly unbelievable: I serve children who have intellectual disabilities and therefore take alternate assessments as dictated by their IEPs. The alternate assessments are required/scheduled according to their birthday. This year I had 4 children who are technically third graders, but only two reached the date cut off for the alternate assessment age requirement. So, what comes in the mail for the two that are too young still for the AA? 3rd grade state ela and math grids of course! Why? Well bc they are 3rd graders and "there has to be some form of accountability for them at the school level". Obviously we did not give them the tests, but no one, anywhere, apparently knows how to fix this glitch and if it is not fixed before the various accountability reports are due and done we will be "penalized" with two non-scorers. The amount of time just spent on this one issue has been tremendous. The inefficiency, mismanagement, and down right stupidity astounds me. Also, I thought this was a chuckle worthy comment after I sent the parents and teachers on our shared community-based listserve the reports about testing errors and the new directions that were shipped out... A teacher responded referring to the 32 million Pearson contract... "So now we are at 32 million plus shipping and handling!?" Would be funny if it wasn't reality. But don't worry, the folks Tisch talks to says all is well... Right, for other people's children and the middle class taxpayers who are footing the bill. They claim every error is typographical. Both NYSED press guy and Merryl Tisch today on WNYC said, of course there are going to be mistakes when you are giving exams to 5 Million students; as though each test was separately typed. In latest email to principals from state ed (last night after 5pm) there were two attachments re mistakes in the 8th and 4th grade math. I am attaching the attachments here. One thing that is completely puzzling is that in the case of the 8th grade exam it says you should announce in advance that there is one question with no answer, but in the 4th you are only allowed to tell that there is a question with two answers if a child asks! …..
During the course of packing the Grades 6, 7, and 8 Math Tests for some schools, we inadvertently included teacher’s directions for the Grades 3-5 Math Tests in place of the teacher’s directions for Grades 6-8. To correct this matter, teacher’s directions for the Grades 6-8 Math Tests were packed and shipped in separate cartons or Tyvek® envelopes to the affected schools. Both the original shipments with the Grades 6-8 Math Test books and the separate packages with Grades 6-8 Math Tests teacher’s directions will be delivered to schools on Friday, April 20, Monday, April 23, or Tuesday, April 24.
prep. It's wonderful. That said, the words "critical thinking" are now beginning to raise red flags with me, especially when anyone claims to be standardizing it. At one time, they were meaningful, but not so much any more. Most of what I used to call critical thinking arises in discussions, where proposing wrong answers is just as valuable as proposing right ones. questions like which animal was the wisest, where we uncover the folly of each and delight in the nonsensicality of the tale. Now there would be some critical thinking and talking going on! But that doesn't work in 2D, neither can it nor should it be standardized. Next thing you know they'll be standardizing creativity. Included in Houghton-Mifflin test prep materials. Reportedly some kids cheered when they heard the “listening” passage. Tuber troubles on city schools test. Move over pineapple -- the yam talked, too. The state’s fourth-grade reading test included an African folk tale about a talking yam, even though versions of the story appeared in test prep books used in city schools, the Daily News has learned. While the passage isn’t confusing like one about a talking pineapple yanked from the tests last week, critics charge that using a listening-comprehension passage that was required reading at some schools offered an unfair edge to those students. RELATED: TALKING PINEAPPLE QUESTION ON STATE EXAM STUMPS ... EVERYONE! The folk tale involves a farmer startled by his talking yam. Everyone he meets dismisses him as crazy and insists the tubers can’t talk -- including, amusingly, other mute objects like a fish, melon and chair. But a version of the yam story appears in a fourth-grade Houghton Mifflin reader and other test prep material available for city schools to purchase, officials said. State Education spokesman Jonathan Burman strenuously dismissed the criticisms of testing contractor Pearson for using the passage, noting the questions were unique to the state exam. “It is absurd to suggest that a passage cannot be used on an exam simply because some students may have previously read that passage,” he said. Brooklyn’s PS 273 principal Melessa Avery said one of her fourth-grade classes used a test prep book with the talking yam story, but she said the test questions required a lot critical thinking. But the NEA has. Does this confirm my contention that our union leaders have one or both feet firmly planted in the bed of the ed deformers? I started razing them on the high stakes testing issue with the UFT leadership well over a decade ago. What they do is toss off a few pieces of meat indicating they are upset at the testing for internal consumption --- just like Obama did to give people some hope he might change and dump Duncan and all will be right. Until the election is over that is. So why do our union leaders refuse to take a stand against high stakes tests? Leave a comment with your best answer. Inspired by a statement endorsed by more than 360 Texas school boards, FairTest, 12 other organizations, and prominent individuals have drafted a national Resolution on High-Stakes Testing. We seek endorsements from organizations and individuals -- and ask that you both sign on and let others know about it. To sign, go to http://timeoutfromtesting.org/nationalresolution/ - where you can also obtain print versions to share with your organization(s). The text of the resolution follows below. resolution passed by more than 360 Texas school boards as of April 23, 2012. It was written by Advancement Project; Asian American Legal Defense and Education Fund; FairTest; Forum for Education and Democracy; MecklenburgACTS; Deborah Meier; NAACP Legal Defense and Educational Fund, Inc.; National Education Association; New York Performance Standards Consortium; Tracy Novick; Parents Across America; Parents United for Responsible Education-Chicago; Diane Ravitch; Race to Nowhere; Time Out From Testing; and United Church of Christ Justice and Witness Ministries. We encourage organizations and individuals to publicly endorse it (see below). Organizations should modify it as needed for their local circumstances while also endorsing this national version. RESOLVED, that [your organization name] calls on the U.S. Congress and Administration to overhaul the Elementary and Secondary Education Act (currently known as the “No Child Left Behind Act"), reduce the testing mandates, promote multiple forms of evidence of student learning and school quality in accountability, and not mandate any fixed role for the use of student test scores in evaluating educators. - To endorse this resolution, go to http://timeoutfromtesting.org/nationalresolution. (Value-Added Measurement Of Pearson, NYSED And Regents Needed) for Pineapplegate and other errors. But Pearson's sins go way beyond that. Please go to www.unitedoptout.com <http://www.unitedoptout.com/> to download our supporting documents. Also please sign your name to the "reply" box to show your support! Enough "signatures" can effect future policy. The curtain has been pulled aside recently from the American Legislative Exchange Council (ALEC), exposing the seedy underbelly of our democracy. Organizations like ALEC circumvent the democratic process in favor of corporations. Financial resources are used to influence public officials and provide model legislation meant to easily pass through state houses of governance. Recent examples include infamous "Stand Your Ground" laws and others that seek to limit the voting rights of marginalized populations. Education reform legislation is also part of ALEC's agenda, with substantial sponsorship from corporate funds to divert the flow of valuable taxpayer dollars away from public schools. * Pearson acquired the Connections Academy, whose co-founder and executive VP is Mickey Revenaugh, also the co-chair of the ALEC Education Task Force. Both Connections and the for-profit University of Phoenix have been or are currently subsidiaries of the Apollo Management Group. The CEO of AMG, Charles (Chaz) Edelstein, was Managing Director of Credit Suisse and Head of the Global Services group within the Investment Banking division, based in Chicago. He is also on the Board of Directors for Teach for America, which is a provider of temporary and inexperienced teachers and also frequently associated with corporate education reform. One prominent name in this regard is TFA alum Michelle Rhee, the failed former Chancellor of DC public schools. * According to Pearson's website: "Pearson Education and the University of Phoenix, the largest private (for-profit) university in the United States announced a partnership which will accelerate the University's move to convert its course materials to electronic delivery." [emphasis added]. As such, Pearson will certainly provide the materials and the mode of transmission. It must also be stated here that many for-profit universities have been under investigation for student loan fraud and unethical recruitment practices. * America's Choice was also recently acquired by Pearson. This organization is directly associated with the Lumina, Broad, and Walton Foundations, all active members of ALEC. They each promote so-called "innovations" that appeal to the corporate and for-profit mindset. * Bryan Cave, LLP is the lobbying firm for Pearson. Edward Koch is currently one of the partners at Bryan Cave. Edward Koch sits conveniently and comfortably on the board for StudentsFirst NY, a branch of the national initiative StudentsFirst, which is the brainchild of failed former Chancellor of DC public schools Michelle Rhee. It must also be stated that Rhee's tenure is under a dark cloud of investigation for rampant test cheating and tampering in the district. * Pearson is contracted with Stanford University to deliver the Teacher Performance Assessment (TPA) to more than 25 participating states. According to Pearson's website, "TPA is led by Stanford University, American Association of Colleges for Teacher Education, and Pearson." Furthermore, "Pearson's electronic portfolio management system will support candidates, institutions of higher education, and state educational agencies by providing registration and account management services, submission of the portfolio for scoring and results reporting." [emphasis added]. Pearson provides the administrative management skills and broad-based technology and delivery systems that will support the Teacher Performance Assessment (TPA) and bring it to a national scale. Stanford University's Office of Technology Licensing (OTL) selected Pearson to provide these needed services for the TPA. Let it be known that the U.S. Dept. of Ed. is currently considering teacher preparation programs to be evaluated based on accountability measures similar to public schools. * Sir Michael Barber is the current Chief Education Advisor for Pearson. It is no secret that Mr. Barber is a powerful advocate for the free-market approach to education, including union busting, merit pay, and turning public schools into privately run charters. * Pearson contracts with Achieve to manage the PARCC assessments. Achieve is funded by Lumina, State Farm (both members of ALEC) and The Alliance for Excellence in Education (AEE). AEE chairman Bob Wise is a regular contributor to and participant with the ALEC educational agenda. Moreover, PARCC awarded Pearson a contract in January to develop a new Technology Readiness Tool, which will support state education agencies to evaluate and determine needed technology and infrastructure upgrades for the new online assessments. Pray tell, who will sell those upgrades? * The Tucker Capital Corporation acted as exclusive advisor to The American Council on Education (ACE) and Pearson on the creation of a groundbreaking new business that will drive the future direction, design, and delivery of the GED testing program. * The Council of Chief State School Officers (CCSSO) partners with a whole cast of other organizations that promote a corporate, anti-public education reform agenda. CCSSO Central "partners" include (among others) McGraw-Hill and Pearson. CCSSO Director Tom Luna works closely with Jeb Bush, whose associations with ALEC and corporate-reform are too numerous to mention. * GradNation is a special project of America's Promise Alliance, sponsored by Alma and Gen. Colin Powell. Grad Nation sponsors include State Farm (ALEC), the Walton Foundation (ALEC), AT&T (on the corporate board of ALEC), The Boeing Company (ALEC), the Pearson Foundation and Philip Morris USA (ALEC). The GradNation Summit list of presenters reads like an ALEC yearbook. * Gen. Colin Powell sits on the Board of Directors for The Council for Foreign Relations, which issued an "Education Reform and National Security" report (co-chaired by Joel Klein and Condoleeza Rice, directed by Julia Levy). The report states, among other things, that: "The Task Force believes that though revamping expectations for students should be a state-led effort, a broader coalition . including the defense community, businesses leaders, the U.S. Department of Education, and others . also has a meaningful role to play in monitoring and supporting implementation and creating incentives to motivate states to adopt high expectations. The Defense Policy Board, which advises the secretary of defense, and other leaders from the public and private sectors should evaluate the learning standards of education in America and periodically assess whether what and how students are learning is sufficiently rigorous to protect the country's national security interests." [emphasis added]. * According to Susan Ohanian: "In the introduction to the Education Reform and National Security report, Julia Levy, Project Director, thanks 'the several people who met with and briefed the Task Force group including the U.S. Secretary of Education Arne Duncan, Mary Cullinane formerly of Microsoft [Philadelphia School of the Future] [now Vice President of Corporate and Social Responsibility for Houghton Mifflin Harcourt], Sir Michael Barber of Pearson and David Coleman of Student Achievement Partners .' They were briefed by Houghton Mifflin Harcourt, and Pearson." * Pearson has partnered with the Bill and Melinda Gates Foundation to create a series of digital instructional resources. In November 2011, the Bill and Melinda Gates Foundation gave ALEC $376,635 to educate and engage its membership on more efficient state budget approaches to drive greater student outcomes, as well as educate them on beneficial ways to recruit, retain, evaluate and compensate effective teaching based upon merit and achievement (the Gates Foundation recently withdrew its support for ALEC under the heat of public pressure). However, their billions of dollars still flow to other far-reaching organizations dedicated to dismantling public education. * The National Board of Professional Teaching Standards is a private-sector member of ALEC. Bob Wise (Chairman, of NBPTS) and Alliance for Excellent Education presented on "National Board's Fund Initiative to Grow Great Schools" at the Education Task Force Meeting at the 2011 ALEC annual picnic. According to the NBPTS website, they "announced that it has awarded Pearson a five-year contract for the period 2009-2013 to develop, administer and score its National Board Certification program for accomplished teachers. Pearson will collaborate with NBPTS to manage its advanced teacher certification program in 25 certificate areas that span 16 subject areas." * Pearson has also acquired partnerships with companies to deliver PARCC, SAT testing, GED testing, and was the central player (through Achieve) in the design of the National Common Core Standards. The GED Testing Service, while wholly owned by the American Council for Education, entered into a joint venture with Pearson to transform the GED for some 40 million adult Americans (one in five adults) lacking a high school diploma. This is an entirely new market. Even with all of Pearson's efforts, they are not the only game in town. McGraw-Hill is another publisher forging similar connections and making money hand over fist due to NCLB-mandated reading programs like Open Court and SRA Reading Mastery. Of course, after billions spent on Reading First and the McGraw-Hill materials, the federally funded evaluation of the program showed no increase in reading comprehension by third grade. McGraw-Hill is also one of the biggest test publishers in the U.S. and publishes the CTBS, the central competitor to Pearson's illustrious SAT-10. * Refuse to buy their materials or adopt them in your courses or for personal use. * Bring these concerns to local PTAs, school boards and libraries. * If required to use Pearson products due to professional obligations, do so under public protest. * Promote the use of ACT rather than SAT, as SAT is a Pearson product. * Inform Pearson of your actions. * If you are in higher education, discuss your concerns with your local Pearson representative, informing them that for these purposes you are not going to adopt their materials in any of your courses. Raise public awareness so the brakes can be put on this madness. Please see our sample letter at the end of this research document, which you are encouraged to share so that others may refuse Pearson products. Aloha - Want to Go to a Screening of GEM Film?